See who's at your door—or who was there while you were away from home.. This brilliant camera system looks like a standard peephole, but gives you far more information than a standard peephole viewer. . A built in motion detector triggers the camera to let you view visitor in real-time, or record and date stamp their activities while you are away from home or not able to answer the door. All the Video recordings are stored on a standard 1 GB SD memory card (not included) which allows you to transfer pictures to computer and see who was at your front door. . Uses 1 rechargeable battery (included) and comes with a recharger. Door must be less than 3" thick. 4 1/4" l x 2 1/2" w x 1"
It is just like a full blown surveillance system and more like an answering machine for your front door. It can't record the thieves sneaking in the side window or crawling across your roof, but it will activate itself and start recording whenever there's motion directly in front of your door. Hello, FedEx guy. FYI burglars always ring the front door bell first, most intruders are looking for a empyty home and not answering your door confrims that and paves the green light to picking your home and breaking in. 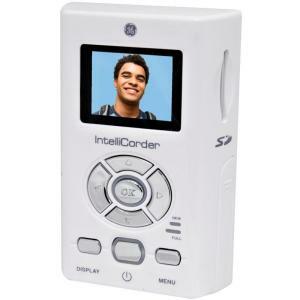 The IntelliCorder stores its videos on internal memory or an optional SD card so you can download them to your hard drive and watch them over and over. Pre-Lock Security believes that every burglar always rings the door bell before they rob your home. As burglars don't really want confrontation they want to determine that no body is home before they start the intrusion. As they expect that you may be home they won't be wearing a mask when they ring the bell. What better idea is there to have a picture of the robber right before he breaks in. Police would sure like that to go on!!! Imagine how surprised everyone will be when they knock at your front door to find out that your peep hole can see them even if you are not home.!!! It's almost like call display on your phone but now it's with a camera!!! This Colour door scope camera mounts easily in place of an ordinary door peep hole, allowing the user to see visitors outside the door on a TV or monitor. Fully adjustable and fits most doors. The latest in hi-tech home alarm security now available for your home from Pre-Lock Security..